- Rates for Europe pluss US$3 (Standard) and UD$10 (V.I.P). - Bach Dang hotel is located by which is famous beauty spot recognised as the world's heritage by UNESCO twice. 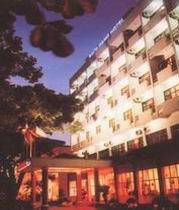 Bach Dang hotel is a 3 star, seven storey hotel consisting of 82 rooms with their overall view over Ha Long bay. It has two elevators, meeting rooms, bars, service centers,souvenir shop, spacious, convinient and safe parking ots under shady century - old trees rows. - Bach Dang Hotel has small and big sized up to 200 seated restaurants serving various delicious dishes wich suit with customers' different tastes and appetites. - Depart from Bach Dang Hotel, you can easily continue yours tour to visit caves on Ha Long Bay and other vestiges and famous landscapes. Our hotel can provide you with necessary facilites and tour guides. - With our experienced, enthusiastic, professionally trained, skillful staffs, Bach Dang Hotel would like to serve and please you. - 80 international standard rooms with well equipped. - Duty free and souvenir shop are available for guests. - Boats and car for rent, and Halong bay sight seeing tours and other tour services.